Don't miss our nationally recognized STEM summer camps just for girls. All Girlstart camps include hands-on STEM activities, cutting-edge technology experiences, collaborative team building, and informal camp fun! 2017 Summer Camps are sold out. Join our wait list today! 2018’s Girlstart Summer Camp registration will open in January 2018. Check back or follow us on social media to be alerted when registration opens! Blast off into the Milky Way! Discover what it takes to launch a satellite, live on the International Space Station, land on the moon, and more. Girls will explore food hydration, generating water, and how to call Earth in this out-of-this-world camp. Help Percy, Annabeth, and Grover adventure through the mythological world! Girls will explore the attributes and adaptations that make mythical creatures unique, engineer a boat to cross the River of Hades, discover the stories behind the stars in our Mini Planetarium, and more. All mortals and demigods welcome! Strike, 3-pointer, goal, ace! Whatever your favorite game, campers will explore the science behind sports. Join the Girlstart all-stars to discover how the body heals from rehabilitation, calculate the winning statistics, construct a stylish performance-enhancing uniform, and more! It’s a bird! It’s a plane! No, it’s Girlstart Super Girl! Engineer your own version of the batmobile, design armor as strong as Iron Man’s, create an LED symbol of strength, construct a protection tool, and more. Learn the secrets behind a superhero’s powers and discover your inner superhero strength. Survive the jungle life in this adventurous camp! Girls will channel their inner Jane as they engineer a sturdy treehouse, design a pendulum to navigate between the trees, discover the importance of adapting to the environment, and more. From gorillas to cheetahs, Girlstart’s campers have the courage, resilience, and strength to take on the African jungle. 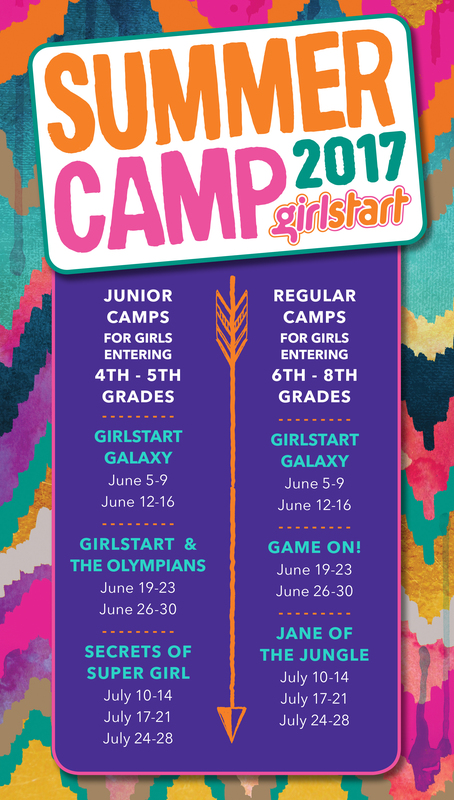 Girlstart Summer Camps are week-long STEM education programs for girls entering the 4th-8th grades. These programs achieve consistent positive outcomes by combining formal and informal educational strategies with challenging and relevant STEM curriculum. Girlstart Summer Camps provide individualized experiences that develop a strong conceptual understanding of STEM subjects and increase participants’ interest in STEM activities and careers. Girlstart Summer Camp ‘to Go’ are held in collaboration with community-based organizations across the nation. In 2017, Girlstart will reach nearly 1,000 girls with Girlstart Summer Camp in Austin, across Texas, and in five other states. Evaluated by Change the Equation as one of only four exemplary STEM education programs in America, Girlstart’s Summer Camp programs have consistently received national recognition. Girlstart Summer Camp allows girls to explore STEM in a fun, informal environment, and equips girls with STEM skills they will use for life. Girlstart cultivates a culture where risk is rewarded, curiosity is encouraged, and creativity is expected. As a result, Girlstart girls are connected, brave, and resilient. Girlstart makes girls more successful, and inspires them to take on the world’s greatest challenges.